adidas Football today revealed the new Real Madrid CF third kit, the first kit ever from the club to be mass-produced from Parley Ocean Plastic ®. The jersey was unveiled by players including Gareth Bale and Karim Benzema at an exclusive event in Hunters Point, New York. The new kit will be worn during the 2018/19 season & comes in a bold new coral colourway. As well as providing a stand-out look both in stadium & on the street, the jersey’s unique colouring represents various shades of coral, an homage to the beauty of the oceans we need to protect. The jersey was revealed on stage at an event that also served as a showcase for the remarkable work being done by Parley For The Oceans. Before the on-stage revel, a panel discussion took place on the topic of plastic pollution, education & the power of sport. The event also featured a photo & shirt exhibit, celebrating the club successes of recent seasons & a Parley workshop where guests could learn more about the programme to tackle marine plastic pollution. As a founding member, adidas supports Parley For The Oceans in its education & communication programmes, as well as its comprehensive Ocean Plastic Program that intends to end plastic pollution of the oceans through the three pillars of the Parley A.I.R. Strategy: Avoid, Intercept & Redesign. Additionally, adidas & Parley For The Oceans collaborate to turn plastic waste into high-performance footwear & apparel by converting up-cycled marine plastic debris into technical yarn fibres. This technology was used to create the new Real Madrid third kit revealed this afternoon. The jersey is available from 14th August onwards & will be worn on pitch for the first time when Real Madrid take on AS Roma on 7th August. 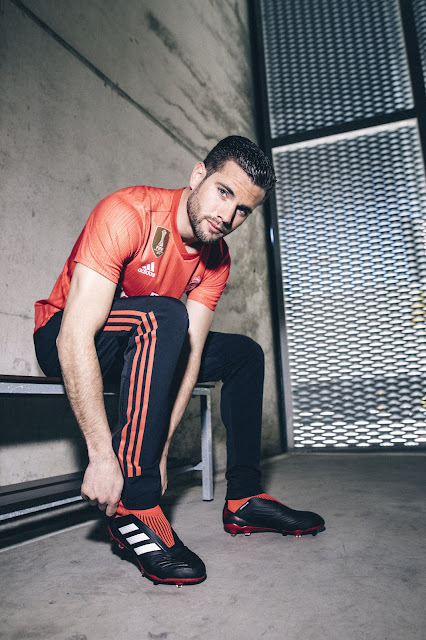 For further information please visit adidas.com/football or follow @adidasfootball/ #adidasMY on Instagram or twitter to join the conversation.